Find tips, messages, and materials to help you share information from the Dietary Guidelines with your patients, clients, and peers. 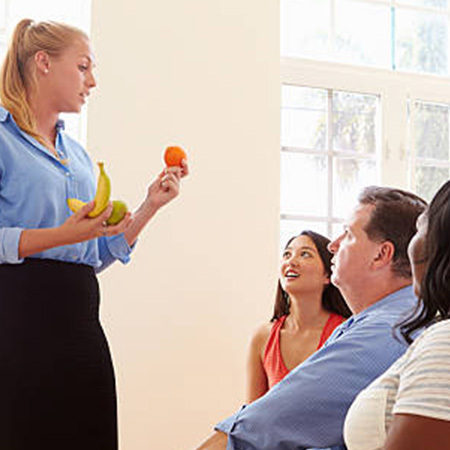 Talk to Your Patients and Clients about Healthy Eating Patterns [PDF] includes nutrition tips and conversation starters for dietitians, nurses and other providers working with individuals. Also available in Spanish [PDF]. How to Build a Healthy Eating Pattern [PDF] features tips to help individuals make nutritious food and beverage choices a part of an everyday routine. Also available in Spanish [PDF]. Shift to Healthier Food & Beverage Choices [PDF] offers a closer look at the Dietary Guidelines concept. Also available in Spanish [PDF]. Cut Down on Added Sugars [PDF] offers a how-to guide for individuals on reducing added sugars. Also available in Spanish [PDF]. Cut Down on Sodium [PDF] offers a how-to guide for individuals on reducing sodium. Also available in Spanish [PDF]. Cut Down on Saturated Fats [PDF] offers a how-to guide for individuals on reducing saturated fats. Also available in Spanish [PDF].